As I teach I am asked what supplies I recommend. My first answer is buy the best you can afford. The old adage "you get what you pay for" absolutely applies here. I feel that the quality is important to not only me but my clients. Thanks to all who came out to the 34th Melbourne Art Festival last weekend. I had a very successful show with my 3D fish painted in Art Resin. I am looking forward to developing new work for the upcoming fall season as this is my last show in the hot, humid south for the summer. My work can be found locally at Art Gallery of Viera, Art & Antique Gallery in Eau Gallie and Green Circle in Cocoa Village. I was ready for this lovely 2 day event however the weather was not. Beautiful first day and then the storm hit early Sunday Morning. Unfortunately, my tent was practically destroyed. Fortunately, I only lost one painting. Much work to be done to be ready for Mt Dora Art Festival but I will get there. I am so pleased to announce my acceptance into the following shows in 2016! 57th Annual Winter Park Sidewalk Art Festival-March 18th, 19th and 20th. Ranked #5 in the nation! Hope to see your friendly face! I am pleased to say I have been accepted in the upcoming art shows here in Florida. First Artnado which is located in West Palm. This is an indoor show November 14th and 15th. Secondly the next weekend I will be at Artworks 2015 in Eau Gallie November 21 & 22. I am very excited about both these show and hope anyone that can will stop by and see my new work! 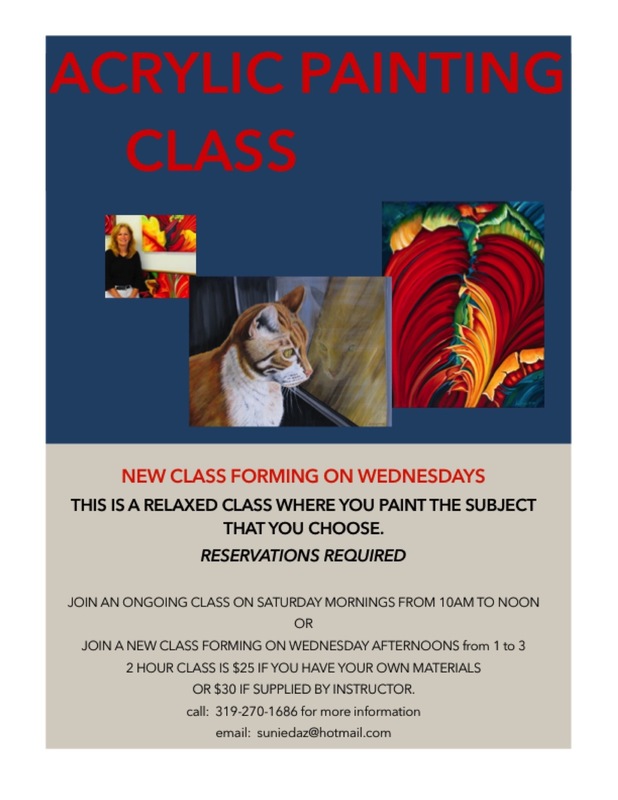 This is a very relaxed class where you will paint a painting of your choice. It is a learn by painting while I demonstrate techniques. Join us for a class and see what you think! Brevard Cultural Alliance-Great Supporter for Florida Arts! How lucky artists are in Brevard County? Extremely when you consider the support of an organization such as Brevard Cultural Alliance. I am so lucky to be associated with this lovely group of people whos mission is to build and sustain a dynamic and vibrants arts and cultural sector integral to Brevard County's quality of life. Their website is the "go to" place for what is happening in the arts in Brevard County. Check out their website and see what I am talking about! Want to learn the ins and outs of acrylic painting...I am pleased to be teaching a new class starting in April at Ralphs Art Supply in Eau Gallie. No experience necessary...just the desire to create! Call to reserve your spot today. 319-270-1686! This weekend is the 1st "Art at the Avenue". This art festival will feature many Florida artists from 10 to 5 pm both Saturday and Sunday. There will be a childrens tent, chalk on the walk and great art to savor! I will be there with my work and would love to see friendly faces! I am very happy to announce that I have joined Art Gallery of Viera. This is a lovely gallery full of amazing artists. 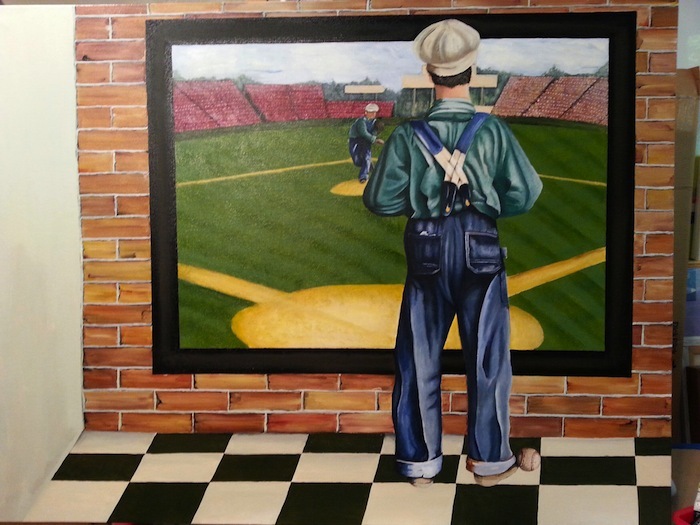 Located at The Avenues in Viera the gallery has a lot to offer with openings monthly, an art festival coming up March 21st and 22nd, classes and just a wonderful, warm group of artists. This work in progress is beginning to take shape. The 3 D effect will continually be enhanced by shading that appears in the final stages of painting. Excited to announce my joint opening night at the Lowe's Art Center in Marion, IA. Fellow artist, Lianne Westcot, and I are exhibiting 50 pieces. The Show is running til the end of November! Opening night Thursday, October 17th from 6:30 to 8pm! 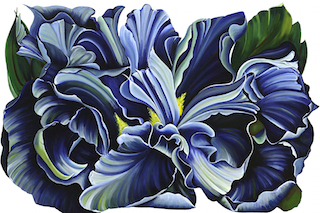 Am pleased to be invited to participate in the Geneva Fine Arts Fair on July 27th and 28th. I hear it is a wonderful show and look forward to meeting the other wonderful artists that art participating. Located in downtown Geneva, Illinois! Look for the upcoming LEAP (Lifetime Enrichment Adult Program) schedule. Lianne Westcot and I will be instructing weekly workshops with this wonderful group. I think lunch time outings to local area resturants are going offered after class! Come join the fun! All art materials will be supplied by the studio.